Deb's Cup of Tea: A reason to shop. 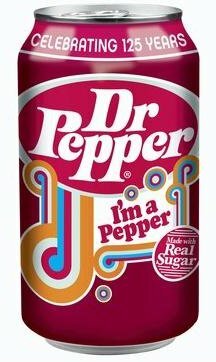 The press release says Dr Pepper is going back to sugar in their soft drink for a limited time to celebrate their 125th anniversary. Supposedly, the product was released last weekend, but I didn't see any in Dominicks when I shopped before the holiday. I guess I'd better trot over there either at lunch or after work. Pepsi did this last year with "Throwback" versions of Pepsi and Mountain Dew. Although I looked, I never saw the bottles. You can buy a "kosher" version of Coca-Cola primarily at Passover. It's made with sugar and has a yellow cap. Pepsi, according to press releases, was surprised at the popularity of the original drink made with sugar. I have high fructose corn syrup Dr. Pepper in the fridge. (I'm a throwback myself. The company removed the "." in the late 1970's but I'm still using it.) If I can find any of this "retro" soda, I will compare the two. I have substantially reduced my soda intake. It's empty calories and, essentially, wasted money. Still, it's summer. It's hot. I have memories of Sunday evenings watching Ed Sullivan's show with roasters full of buttered and salted popcorn and washed down with soda. You were allowed one on Sunday and then one later in the week. Oh wow. How good an ice cold soda felt after playing ball all afternoon with your brothers and sister. I remember plopping down in the living room with one of dad's hamburgers and watching the Minnesota Twins. I know this is marketing at its best. Appeal directly to those of us with the most disposable income. Tug on those heartstrings. Bring back memories of a simpler time during a period when life is quite complicated and stressful. Actually about the time pepsi was releasing their throwback mountain dew and pepsi i found throwback dp as well. The can was different though, so they've already dipped their toes into it a bit.